Matt's One Stop has reached the 40th year serving the Sound Beach and surrounding area. 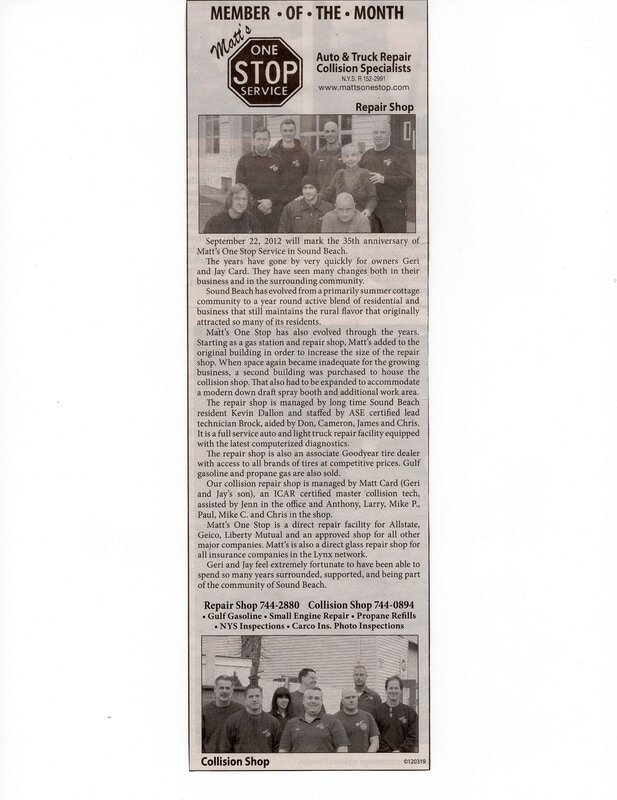 Through those years there have been many changes both to this tight knit community and to Matt's One Stop. Sound Beach has evolved from a primarily summer cottage community to a thriving area of year-round homes and growing businesses. The original Matt's One Stop located on New York Avenue is the mechanical repair shop and Gulf gas station. The building has been expanded over the years to accommodate new equipment needed to properly service modern autos and trucks. The extension to the repair shop soon became inadequate and a second building across the street was purchased to house the collision portion of the business. That building has also been expanded to allow space for a modern down draft spray booth and frame straightening equipment. Geri [recently retired] and Jay Card, the founders come from long backgrounds in the auto repair industry. 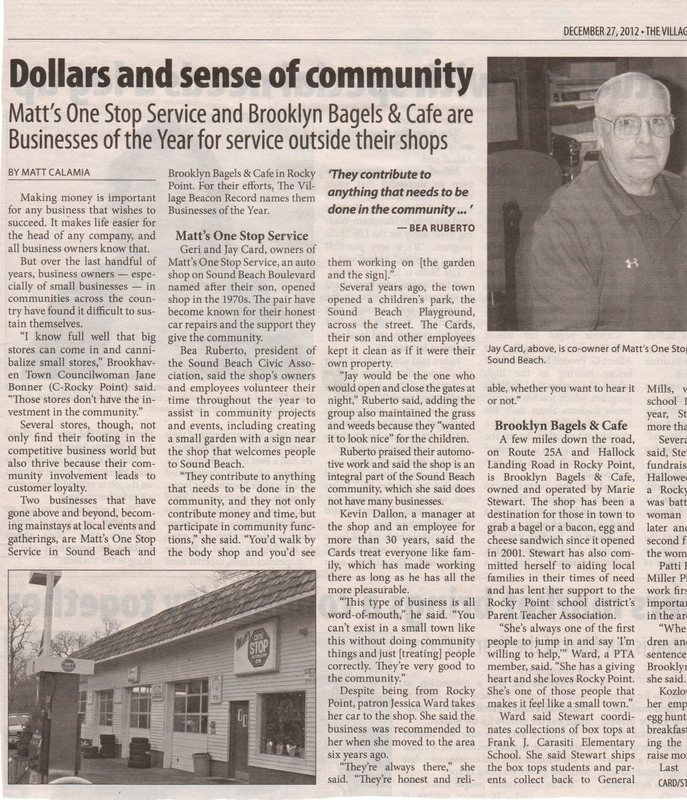 Geri's father owned shops in Oceanside and Rockville Centre, he was also an original partner in Matt's One Stop. Jay's father owned shops in Brooklyn. Jay attends to the business while long time Sound Beach resident, Kevin Dallon manages the repair shop assisted by foreman Brock and staffed by Cameron, James O, James B and Ray. 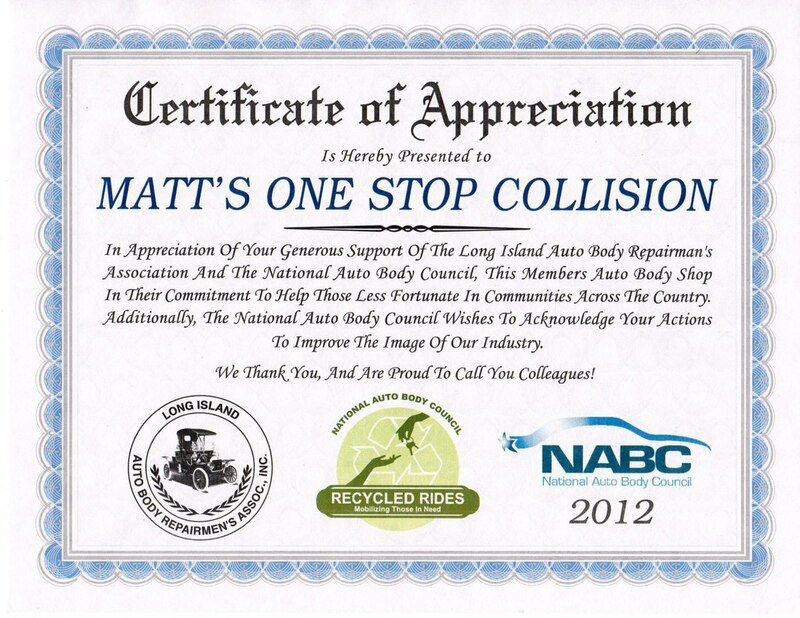 Matt Card [the business' namesake and owner] manages the collision shop assisted by Wally, Jen and Antoinette in the office and Matt B, Larry, Ralph, Tommy, Jimmy, Tyler and Russell in the shop. The technicians at both shops hold many ASE and I-Car certifications and are continually attending classes to stay abreast of the latest innovations in the industry, including Hybrids. The repair shop offers computerized engine diagnostics and repair, Hunter wheel alignments, NYS Emission Inspections, complete front-end and brake service and computerized wheel balancing. We also do small engine repair and service. Call and ask Kevin or Jay about our very competitive prices on all brands of tires, especially Good Year. The collision shop has computerized color matching and laser measured uni-body frame repair. 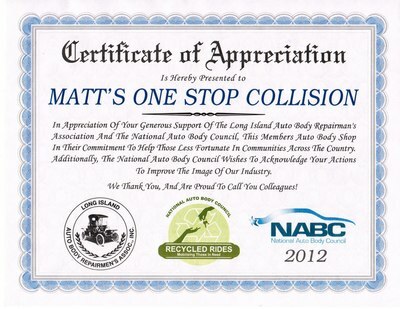 Matt's One Stop is a direct repair shop for Allstate and Geico insurance companies and the quality of our work is recognized by all major insurers. 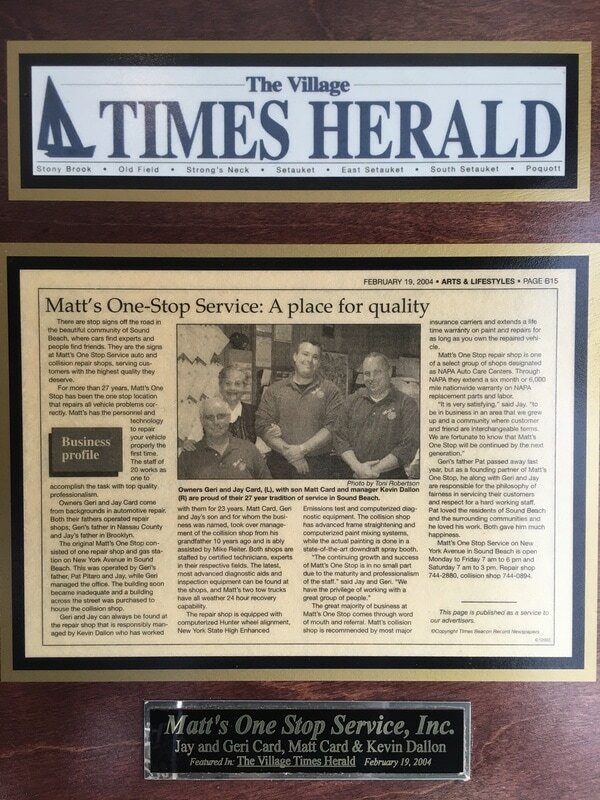 Although there have been many changes at Matt's One Stop over 40 years, our commitment to performing quality repairs at fair prices and our commitment to serving our customers with respect will always be our primary objectives. Matt's One Stop offers Gulf gasoline, propane barbecue tank refills, Carco insurance photo inspections and 24 hour towing. We recently refurbished our building exteriors to enhance the Sound Beach business District.